More from the Irving Berlin, Inc. organization! Not only was the eponymous firm successful, so was Irving himself. This is an interesting number, and most people today would consider it over the top corny. Listen to the recording from the Library of Congress of a contemporaneous Victor recording and decide for yourself, but we felt this was more typical of music of the 1890s than the 1920s. We are happy to offer the original sheet music of While the Years Roll By for download as a PDF file. The download includes the colorful original cover, and the price is $3.50. Charge it to your credit card or PayPal account. Thanks to the Library of Congress, you can stream a Victor Record recording of this classic. The orchestra is not named, but we are told that it was conducted by Rosario Bourdon. 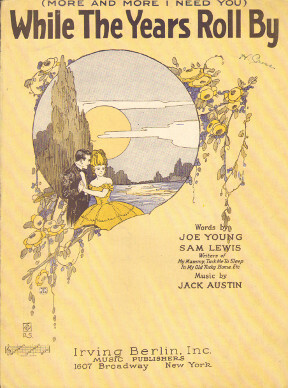 The harp was played by Francis J. Lapitino, the contralto was Elsie Baker, and the baritone was Elliot Shaw. It was recorded September 11, 1922. Want to try this one out yourself, or, as they said in the day, "Try this on your piano!" Perhaps that old upright piano in your own front parlor? Or, perhaps, try it on your harp! But by all means do get the sheet music! Please CLICK HERE to return to our main MUSIC page. Look up our offerings by STATE!